Discussion in 'Baja Bytes By Gary Graham' started by Baja Bytes, Jun 18, 2018. 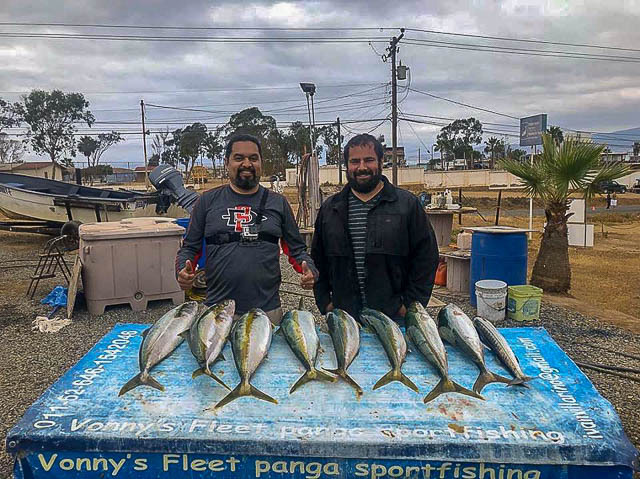 In spite of the recent storms, the summertime Baja fishing is ramping up from below the border on the Pacific side with bluefin offshore and inshore there are yellowtail, barracuda, calico bass, and halibut, as well as a few white seabass to sweeten the pot. 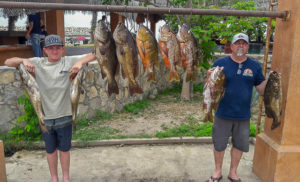 Farther down the Esteros, the areas around La Bocana and Abreojos are producing some epic fishing for a variety of species. At the tip, there are still double-digit stripers and the bigger blues already bustin’ tackle. That’s just a teaser…keep reading. The weather has finally begun to settle into a summer mode with a few grumpy days remaining on the water. That said, nice-sized halibut are in the flats between the Islands and shore. Sea temps are climbing, and the water is beginning to clear. Also, there has been a pretty good showing of legal-sized barracuda along the kelp line and just to the outside under birds. Yellowtail continue to show well around the Islands. Party boats are reporting that good scores of yellows are on the weather side of North Island at Pukey Point and as well as at the Keyhole, the ridge running through the Middle Grounds, in the Middle Islands area (Gun Site & Genoa Kelp), along the weather side of South Island and from the Lighthouse to South Kelp. Any of these locations could light up with plenty of yellows. The better quality appears to be at North Island and in the Middle Grounds with a good percentage of them weighing from 15- to 20-pounds. Elsewhere, most are smaller 8- to 12-pounders. A fair amount of barracuda are also around. If you focus on them, the action is good. The Middle Grounds, Ribbon Kelp, and South Kelp are loaded. Watch for the bird schools. Most of these have all you want of barracuda, too. They are chewing the surface iron — a Tady C or 45. 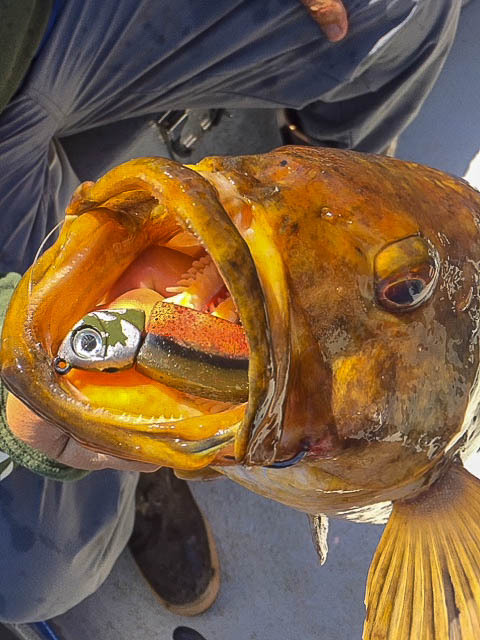 Lastly, there are some very impressive calico bass biting right now. 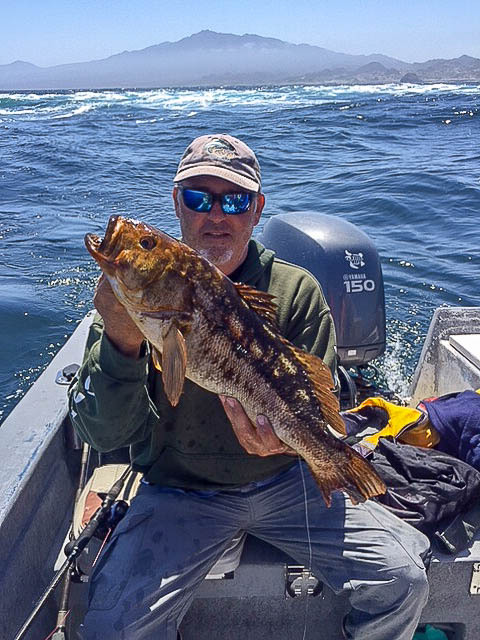 Some big 4- to 7-pounders are biting in the shallower spots in the Middle Grounds, Genoa Kelp and Boiler Rocks in the Middle Islands area. Bluefin are being found in the Canyon. 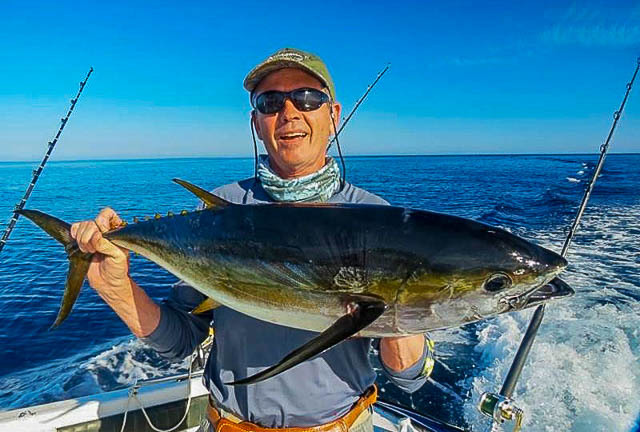 Although they didn’t want to bite, there were a few 50-pound class tuna caught on fly-lined sardines and Flat-fall jigs. Lots of boats are working this area — pretty much the entire fleet. They are finding plenty of bluefin, but once again they are not biting worth a darn. The few being caught are primarily coming on a hot sardine fished on 20- to 30-pound flourocarbon or on the Nomad plugs thrown right into the middle of a foamer. The best tactic is to figure out which way they are moving and move into a position where the school comes to you. Driving right into the melee and shutting down drives the fish away. Sammy Susarrey Sportfishing clients caught an early white seabass, raising expectations for an exciting beginning to the summertime Baja fishing season. 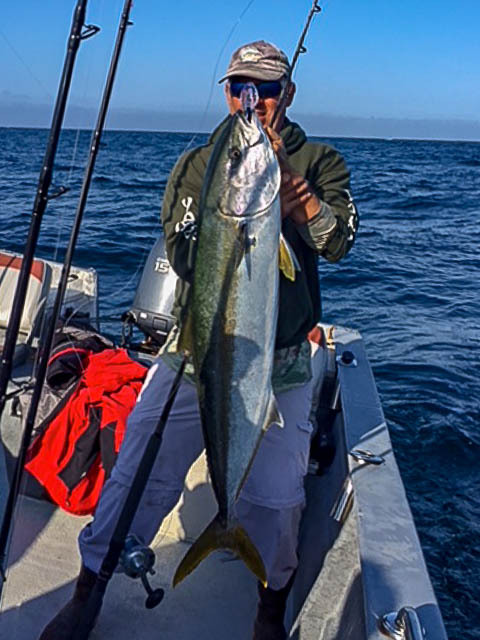 Limits of yellowtail at Vonnys Fleet confirmed it is summertime at last! Fished with Jaime today; we did a half-day this afternoon as we drove down. We fished in the bay for over 50 sand bass and went out to point and got a bunch of sugar bass and couple calicos; we ended the day with a 14-pound Hali caught on a small lizard fish. Fun day with a great captain! We started around 11:30 and headed in at 5:30. Big yellows and big bass were biting this past week at the Island. Seals were around and problematic at times. 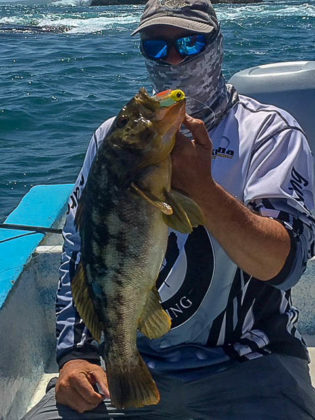 Surface iron, trolled Rapalas, stickbait, and live bait were all working well for the yellows along the south of the Island at Punta Piedraand Bajo El Morro. Calico bass fishing was ridiculous on 2-oz. Warbaits Leadheads in Camo, Orange, Yellow and Red Crab colors matched with 5” Rodge Garage swimbaits in Wounded Soldier, Red Crab, and Pregnant Smelt colors — working very well. These are very durable swimbait and are much needed on 100 fish days like we are having at the Island right now. Quality grade as you can see from the photos stuffed with eggs. A couple of white seabass were also caught on plastics near the airport. That’s a wrap…. 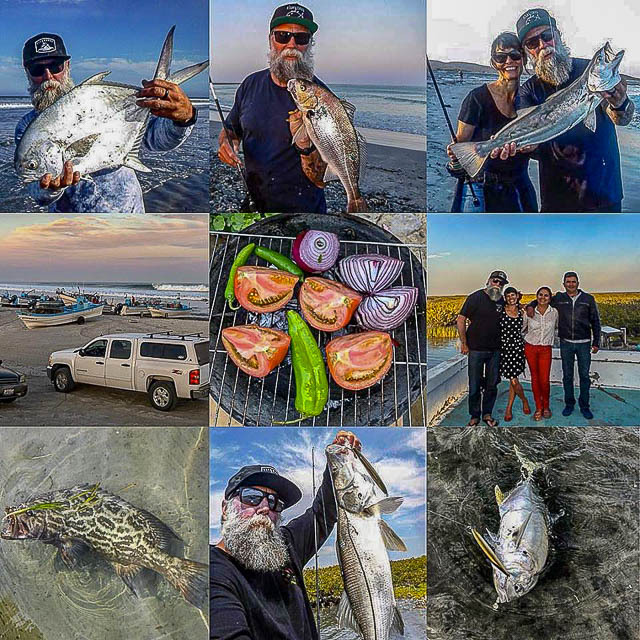 another epic Baja trip for the books! 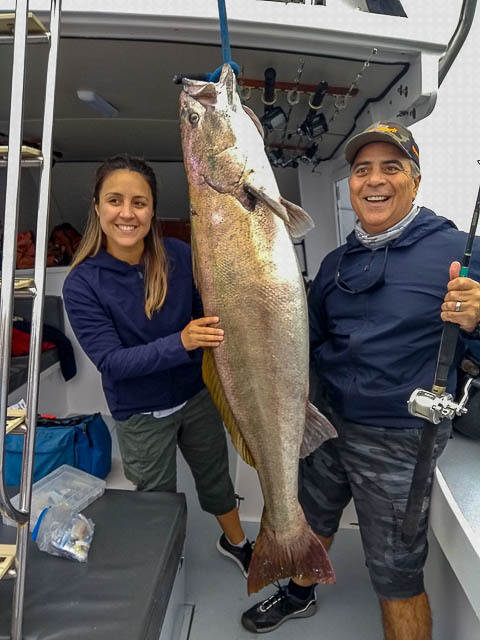 I don’t know anything about the 12-pound one, but we found a loaded sargasso paddy north of Lobo and landed five dorado in the 6- to 8-pound range. 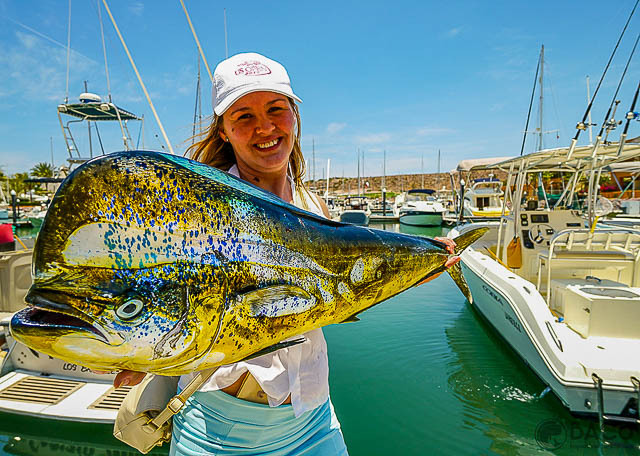 The first dorado nailed a blue and white feather as we trolled by and the rest fell to live sardina. As always, bigger fish were haunting the same paddy but swimming deeper. No sails and no marlin have been in the mix so far. Everyone I spoke to said the Pulpito had finally popped open with a good yellowtail bite. 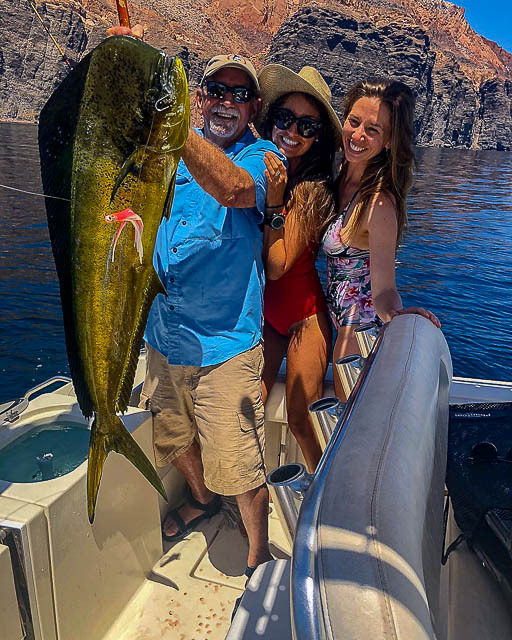 Captain Tony Davis’s clients hit a honey hole for six yellowtail and one amberjack with weights from 16 to 25 pounds all on mackerel. Lots of sargasso close to shore but those we slipped by were all empty. The fish were bunched up under the offshore paddies, but not all were biting. 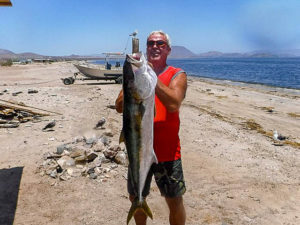 As summer begins to close in on us here in La Paz, we’ve seen a few very hot days which were balanced by some nice, chilly afternoon breezes; the flux of dedicated anglers who follow the fish has picked up for the summertime Baja fishing season, and so has the number of hookups of several species. Four boats went out and all anglers aboard caught limits of YFT. 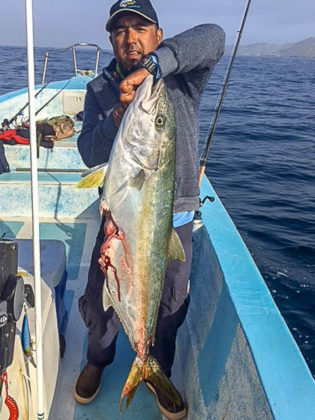 One super panga fishing live bait for roosterfish right off the beach in front of the Lighthouse took limits of yellowfin from 30- to 64-pounds. About 20 miles outside of Pulmo Park, anglers limited on football-sized tuna under the porpoise. Because of Tropical Storm “Bud,” fishing opportunities were shortened and a moderate crowd of anglers were in town; we were only able to launch Sunday, Monday, and Tuesday before Red Flag conditions closed all Port Operations. There were scores of world-class surfers in San Jose Del Cabo for the International Pro Event annually held at Costa Azul, and due to the heavy storm-swell conditions of up to 15- to 20-feet, even this contest was postponed. 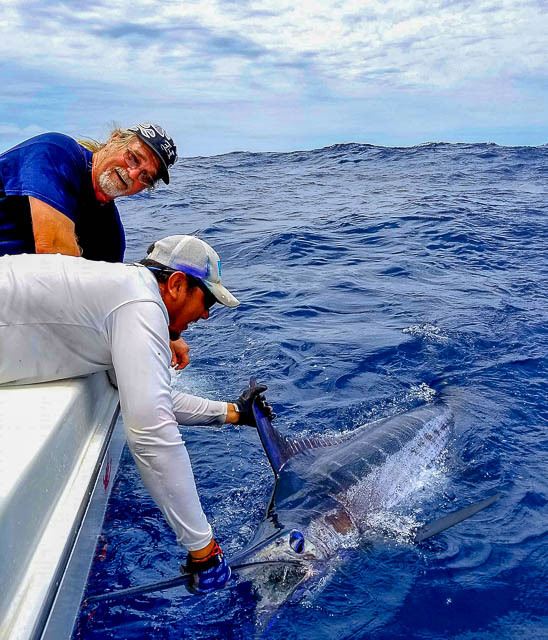 After the storm, fishing started out much the same, with the striped marlin action being the most consistent; this was near the Iman and Desteladera Banks where large schools of baitfish congregated — mainly sardineta — with a small percentage of mackerel mixed in. This frenzy kept the billfish on these grounds. Fleets were arriving in significant numbers from all directions to get in on the action. These fish were striking best on bait, either while slow trolling or drifting. however, some small football-sized tuna were taken in open water while trolling. 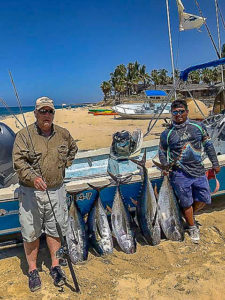 There were also scattered reports of tuna moving with porpoise farther offshore from Cabo San Lucas — mainly smaller fish but proving to be hit or miss. Before the storm arrived, there was a flurry of missed wahoo strikes on trolled lures reported, some lost right at gaff. Dorado were absent as well. 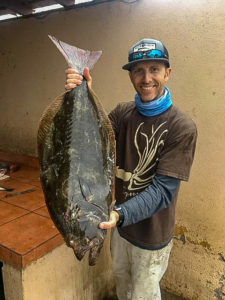 The fishing started off with sporadic shallow-water bottom catches; increasing swells and currents made this option more difficult, though a few were caught, including one 60-pound broomtail grouper, barred pargo weighing around 15-pounds and leopard grouper to over 20 pounds. A mix of yellow snapper, pompano and surgeonfish rounded out the structure bite. 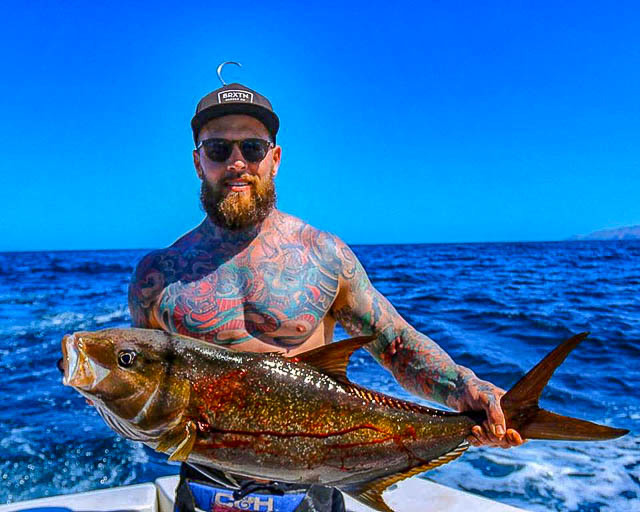 Early on, we did have charters that released roosterfish in the 75-pound range. Numbers at a glance: Billfish 50%, tuna 31%, dorado 4%, other species 12%. Because of Tropical Storm “Bud,” the port closed Wednesday through Friday. Before then, the fishing was decent! Still a good marlin bite, and more tuna than seen previously. When the port opened, fleet boats caught a lot of fish, with tuna numbers continuing to grow immensely. We’re hoping this storm may bring a few more mahi-mahi, as we only saw one caught so far after the storm. WEATHER CONDITIONS: Minimal wind, some swell, clear skies. AVERAGE WATER TEMP: Water temps varied from 60°F to 76°F. BEST LURES: Caballito, sardina, mackerel, cedar plugs, and feathers. 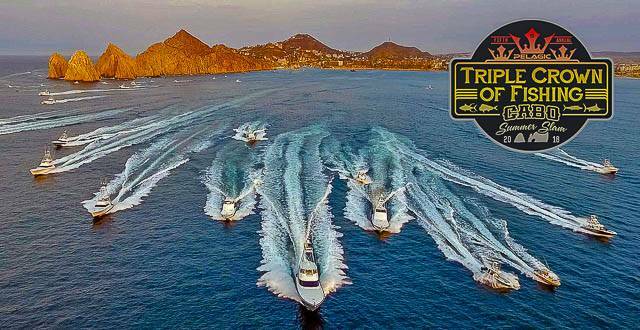 June 7-9, 2018 – Cabo San Lucas, Mexico – The fifth installment of the PELAGIC Triple Crown of Fishing – Cabo Summer Slam overflowed with excitement as a 31-team tournament fleet cashed in on a red-hot marlin bite south of the border. BornFisher, Tunahead and mulegemike like this. GREAT REPORT and Pics Gary! 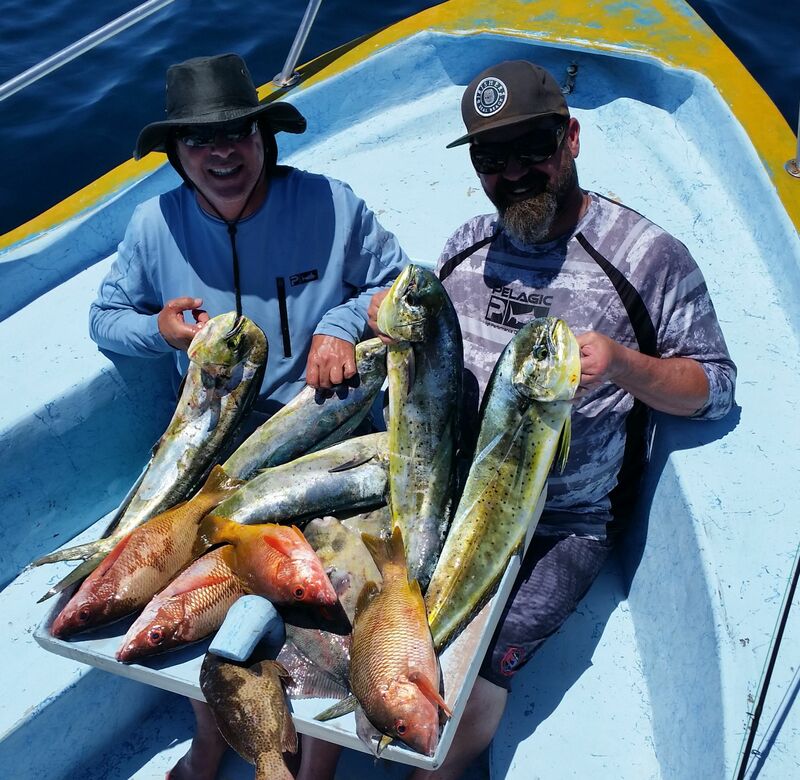 Some serious WSB and Dorado! NICE! Can't wait. Another great report Gary. I know a lot of time goes into it!. Ill be heading down in 2 weeks to Los Cabo's then back again in September. 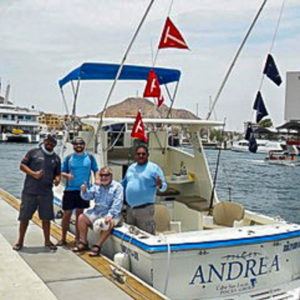 Is there any captain or business that you recommend for panga fishing in the Cabo area? Sorry! No! I fish with friends that keep their boats there.